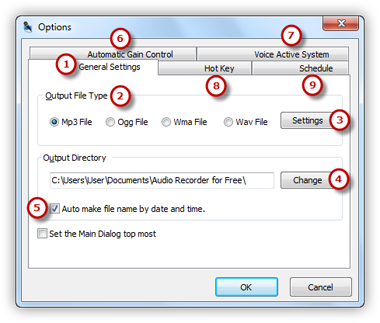 Audio Recorder for Free can be a scheduler program in such a way that, the application starts automatically at a specific time, performs the recording, and closes automatically. You simply specify the time for the recording to start and the duration for the recording to stop. Now, do your own work and you will miss the online radio program no more. 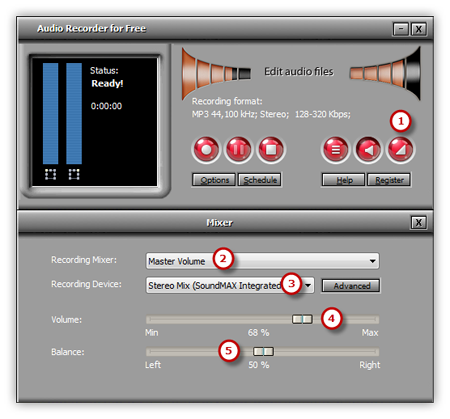 Launch Audio Recorder for Free. Click “Show Mixer Window” button to select the sound card in your system and choose “Stereo Mix” as sound source. You can adjust the Volume and Balance. Click “Options” and a window will be activated. In “General Settings” area 1, you can specify an output format among MP3, WAV, WMA and OGG 2. Click “Settings” 3 to adjust the recording quality by well-configured presets or configuration parameters. Click “Change” to select an output folder. It also has the ability to name the recorded file automatically by date and time. Other settings like AGC, VAS, Hot Key and Schedule are also available. Click “Schedule” button to activate schedule recording window and check “Enable Schedule Recording” . You can select the schedule to be involved with Once, Daily or Weekly. 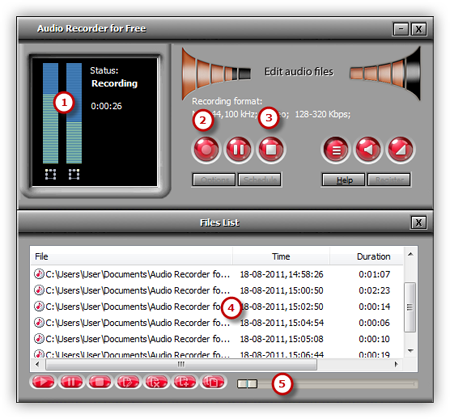 Once – with this option the scheduled recording will be performed only once at the selected date and time for the specified duration . 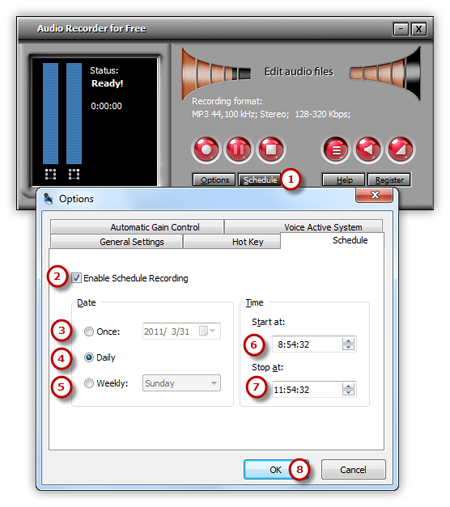 Daily – with this option the scheduled recording will be performed daily at the selected time and for the specified duration, starting from the date specified by Start Date to the date specified by Expire Date . You can also specify the starting time & ending time that is precise to seconds by entering the number or clicking the Up/Down arrow. Then, click “OK” to save all your settings of schedule recording.